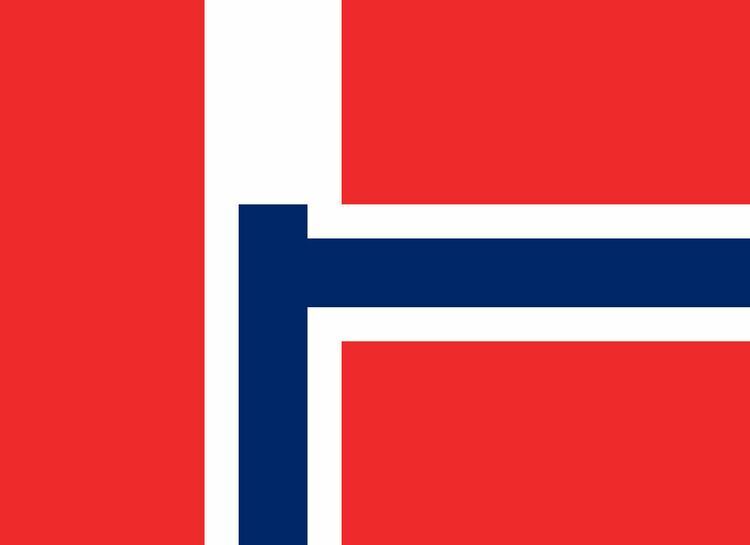 Norway (/ˈnɔːrweɪ/ NAWR-way; Norwegian: Norge (Bokmål) or Noreg (Nynorsk) officially the Kingdom of Norway, is a sovereign and unitary monarchy whose territory comprises the western portion of the Scandinavian Peninsula plus the island Jan Mayen and the archipelago of Svalbard. The Antarctic Peter I Island and the sub-Antarctic Bouvet Island are dependent territories and thus not considered part of the Kingdom. Norway also lays claim to a section of Antarctica known as Queen Maud Land. Until 1814, the Kingdom included the Faroe Islands (since 1035), Greenland (1261), and Iceland (1262). It also included Isle of Man until 1266, Shetland and Orkney until 1468, and the following provinces, now in Sweden: Jämtland, Härjedalen and Bohuslän. Norway has a total area of 385,252 square kilometres (148,747 sq mi) and a population of 5,258,317 (Jan 2017). The country shares a long eastern border with Sweden (1,619 km or 1,006 mi long). Norway is bordered by Finland and Russia to the north-east, and the Skagerrak Strait to the south, with Denmark on the other side. Norway has an extensive coastline, facing the North Atlantic Ocean and the Barents Sea. King Harald V of the Dano-German House of Glücksburg is the current King of Norway. Erna Solberg became Prime Minister in 2013, replacing Jens Stoltenberg. A constitutional monarchy, Norway divides state power between the Parliament, the Cabinet, and the Supreme Court, as determined by the 1814 Constitution. The Kingdom is established as a merger of several petty kingdoms. By the traditional count from the year 872 the Kingdom has existed continuously for 1,144 years, and the list of Norwegian monarchs includes over sixty kings and earls. The country has the fourth-highest per capita income in the world on the World Bank and IMF lists. On the CIA's GDP (PPP) per capita list (2015 estimate) which includes territories and some regions, Norway ranks as number eleven. From 2001 to 2006, and then again from 2009 to 2015, Norway had the highest Human Development Index ranking in the world. Norway has topped the Legatum Prosperity Index for seven years in a row as of 2015. Norway also ranks first on the OECD Better Life Index, the Index of Public Integrity, and the Democracy Index. Old Norse norðmaðr was Latinized as Nortmannus in the 9th century to mean "Norseman" and also "Viking", giving rise to the name of the Normans. After Norway had become Christian, Noregr and Noregi had become the most common forms, but during the 15th century the newer forms Noreg(h) and Norg(h)e, found in medieval Icelandic manuscripts, took over and have survived until modern day. In 1349, the Black Death radically altered Norway, killing between 50% and 60% of its population and leaving it in a period of social and economic decline. The plague left Norway very poor. Although the death rate was comparable with the rest of Europe, economic recovery took much longer because of the small, scattered population. Before the plague, the population was only about 500,000 people. After the plague, many farms lay idle while the population slowly increased. However, the few surviving farms' tenants found their bargaining positions with their landlords greatly strengthened. Margaret was working toward a union of Sweden with Denmark and Norway by having Olaf elected to the Swedish throne. She was on the verge of achieving this goal when Olaf IV suddenly died. However, Denmark made Margaret temporary ruler upon the death of Olaf. On 2 February 1388 Norway followed suit and crowned Margaret. Queen Margaret knew that her power would be more secure if she were able to find a king to rule in her place. She settled on Eric of Pomerania, grandson of her sister. Thus at an all-Scandinavian meeting held at Kalmar, Erik of Pomerania was crowned king of all three Scandinavian countries. Thus, royal politics resulted in personal unions between the Nordic countries, eventually bringing the thrones of Norway, Denmark, and Sweden under the control of Queen Margaret when the country entered into the Kalmar Union. The famine of 1695–96 killed roughly 10% of Norway's population. The harvest failed in Scandinavia at least nine times between 1740 and 1800, with great loss of life. The Romantic Era that followed the reign of King Charles III John brought some significant social and political reforms. In 1854, women won the right to inherit property in their own right just like men. In 1863, the last trace of keeping unmarried women in the status of minors was removed. Furthermore, women were then eligible for different occupations, particularly the common school teacher. However, by mid-century, Norway was still far from a "democracy". Voting was limited to officials, property owners, leaseholders, and burghers of incorporated towns. There was some dissatisfaction with this system. Marcus Thrane was a Utopian socialist. He made his appeal to the labouring classes urging a change of social structure "from below upwards." In 1848, he organised a labour society in Drammen. In just a few months this society had a membership of 500 and was publishing its own newspaper. Within two years 300 societies had been organised all over Norway with a total membership of 20,000 persons. The membership was drawn from the lower classes of both urban and rural areas; for the first time these two groups felt they had a common cause. In the end, the revolt was easily crushed; Thrane was captured and in 1855, after four years in jail, was sentenced to three additional years for crimes against the safety of the state. Upon his release, Marcus Thrane attempted unsuccessfully to revitalise his movement but, after the death of his wife, migrated to the United States. Parts of southeastern Norway including parts of Mjøsa have warm-summer humid continental climates (Köppen Dfb), while the more southern and western coasts are mostly of the oceanic climate (Cfb). Further inland in (southeastern and northern Norway, subarctic climate (Dfc) dominates; this is especially true for areas in the rain shadow of the Scandinavian Mountains. Some of the inner valleys of Oppland get so little precipitation annually, thanks to the rain shadow effect, that they meet the requirements for dry-summer subarctic climates (Dsc). In higher altitudes, close to the coasts of southern and western Norway, one can find the rare subpolar oceanic climate (Cfc). This climate is also common in Northern Norway but there usually in lower altitudes, all the way down to sea level. A small part of the northernmost coast of Norway has the tundra/alpine/polar climate (ET). Large parts of Norway are covered by mountains and high altitude plateaus, many of which also exhibit the tundra/alpine/polar climate (ET). Stunning and dramatic scenery and landscape is found throughout Norway. The west coast of southern Norway and the coast of northern Norway present some of the most visually impressive coastal sceneries in the world. National Geographic has listed the Norwegian fjords as the world's top tourist attraction. The 2014 Environmental Performance Index put Norway in tenth place, based on the environmental performance of the country's policies. In August 2014, the Government Pension Fund controlled assets were valued at approximately US$884 billion (equal to US$173,000 per capita) which is about 174% of Norway's current GDP. It is the largest sovereign wealth fund in the world. The fund controls about 1.3% of all listed shares in Europe and more than 1% of all the publicly traded shares in the world. The Norwegian Central Bank operates investment offices in London, New York and Shanghai. Guidelines implemented in 2007 allow the fund to invest up to 60% of the capital in shares (maximum of 40% prior), while the rest may be placed in bonds and real-estate. As the stock markets tumbled in September 2008, the fund was able to buy more shares at low prices. In this way, the losses incurred by the market turmoil was recuperated by November 2009. On 1 January 2013, the number of immigrants or children of two immigrants residing in Norway was 710,465, or 14.1% of the total population, up from 183,000 in 1992. Yearly immigration has increased since 2005. While yearly net immigration in 2001–5 was on average 13,613, it increased to 37,541 between 2006 and 2010, and in 2011 net immigration reached 47,032. This is mostly because of increased immigration by residents of the EU, in particular from Poland. Most Norwegians are registered at baptism as members of the Church of Norway which used to be the official state religion. The constitution still requires that the reigning monarch must be Lutheran and that the country's values are based on its Christian and humanist heritage. Many remain in the church to participate in the community and practices such as baptism, confirmation, marriage and burial rites. About 74.3% of Norwegians were members of the Church of Norway in 2015. In 2014, about 59.3% of all newborns were baptised and about 62.9% of all 15-year-old persons were confirmed in the church. The Sami minority retained their shamanistic religion well into the 18th century, when most converted to Christianity under the influence of Dano-Norwegian Lutheran missionaries. Some retained their ancient religion. Today there is a renewed appreciation for the Sami traditional way of life, which has led to a revival of Noaidevuohta. Some Norwegian and Sami celebrities are reported to visit shamans for guidance. Norway has been a progressive country, which has adopted legislation and policies to support women's rights, minority rights, and LGBT rights. As early as 1884, 171 of the leading figures, among them five Prime Ministers for the Liberal Party and the Conservative Party, co-founded the Norwegian Association for Women's Rights. They successfully campaigned for women's right to education, women's suffrage, the right to work and other gender equality policies. From the 1970s, gender equality also came high on the state agenda with the establishment of a public body to promote gender equality, which evolved into the Gender Equality and Anti-Discrimination Ombud. Civil society organisations also continue to play an important role, and the women's rights organisations are today organised in the Norwegian Women's Lobby umbrella organisation. Other internationally recognised bands are A-ha, Röyksopp, Ylvis and Maria Mena. A-ha initially rose to global fame during the mid-1980s. In the 1990s and 2000s the group maintained its popularity domestically, and has remained successful outside Norway, especially in Germany, Switzerland, France and Brazil. Sports are a central part of Norwegian culture, and popular sports include Association football, biathlon, cross-country skiing, ski jumping and, to a lesser degree, ice hockey and handball. Norway is the most successful country in the Winter Olympics of all time.